Shahid Kapoor's better half, Mira Rajput Kapoor is no less than other actresses when it comes to maintaining her good bod after pregnancy, beautiful skin and fantastic fashion choices. She has been a paparazzi favourite from the very moment she has shown us what it is to be a good wife and mother with the perfect balance of being glam. Mira has never been media-shy and is absolutely adored for her straightforward personality. It's not been long that she has become a social media star and celebrity in her own unique way. But if there's one thing we have to pick that we absolutely LOVE about her, then it is her radiant and clear skin. Mira has also been one of the top celebrity mothers who has given us major fitness goals. After the wedding, we often spotted her hitting the gym with her dearest hubby Shahid Kapoor. Well if you love going to the gym or are into exercising then you must be aware that taking care of your skin becomes a little tricky. Apart from being a fit mommy and being consistent with her gym, there is one more thing she swears by for her flawless skin. On her Instagram stories, she revealed that there is one home remedy she uses every other day to keep her skin glowing and blemish free! And no don't worry it's not going to dig a hole in your wallet. It's sitting right in front of you in the refrigerators. Wondering what it is? 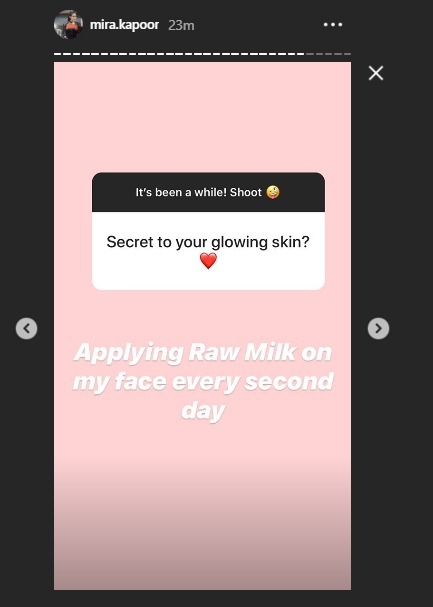 The secret to Mira's ethereal glow is none other than raw milk. Raw milk is one ingredient that woman have been using since ages to nourish their skin. It is an amazing source of nutrients for your skin. Going back in history, it is also said that Cleopatra used to bathe in donkey's milk every single day. Well, no we don't think we want you to do that. We suggest you include milk in your daily skincare routine. Raw milk stays to be a great source of Vitamin A, B6, D, B13, protein, calcium, lactic acid and a few others. Do you see what it is one of the best beauty ingredients in your kitchen? Raw milk helps in brightening, exfoliating, hydrating and soothing your skin by reducing dark spots, preventing acne and boost collagen production. It can literally solve most of your skin troubles so here are a few ways in which you can include raw milk in your beauty regime. Once you have washed your face with a mild cleanser, dip a cotton ball into some raw milk and dab it on your face. The milk will further moisturise and cleanse your skin. Let it stay on your skin for a few minutes, until it soaks and then apply your moisturiser. You can use raw milk as a mixing agent in all the face packs you prepare at home. The easiest and most effective face pack that includes raw milk is with besan and turmeric. The pack works best for getting rid of tan as well as lightening and brightening of the skin. Raw milk itself can act as a wonderful hydrating mask for your skin. If you are from the dry and sensitive skin family, then apply a thin layer of milk with a brush to your entire face. Let it sit for 5 minutes and build it up with another layer of raw milk. Leave this mixture on your face for 25-30 minutes. Wash it off with cool water and you'll be amazed to see the smooth and soft skin. It's time you too include milk in your skincare routine and keep all skin troubles away!